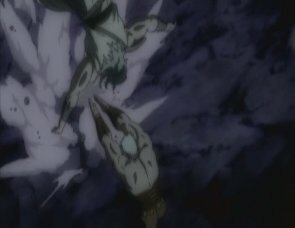 Toki's final battle against Raoh is re-told. 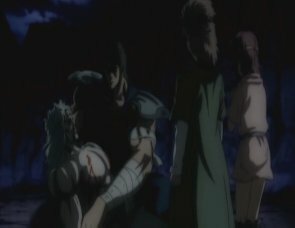 Kenshiro, Bat and Lin watch as Toki starts to fight Raoh. Years before this fight, Toki, Raoh and Kenshiro were still competing between each other to become the successor. 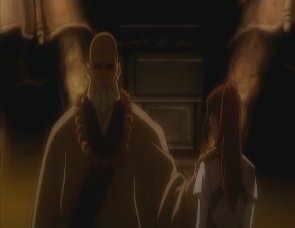 It seemed that Toki was the best fighter, but Sara, a doctor, informed Ryuken that Toki had a life threatening disease and only had a few years left to live. 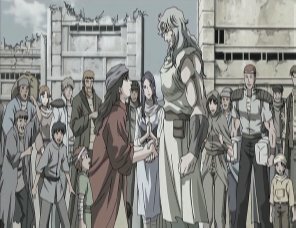 Ryuken talks to Toki about political issues, as there is a strong chance war will break out across the world. 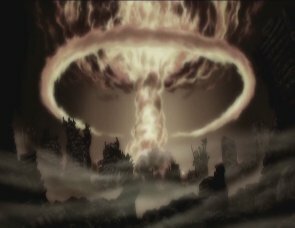 If that happens, the world will be engulfed in flames and what is left will be ruled by violence. Toki thinks that this cannot be avoided. 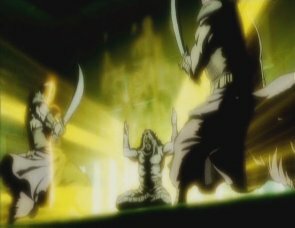 Ryuken tells Toki that the successor to Hokuto Shinken's mission is to bring peace in violent times. Ryuken then asks if Toki knows what he will do in this upcoming new age. Toki just says that this new era will need a savior, and he will protect him with his body and soul. Ryuken is taken aback by this, but he realises Toki has made up his mind. He thinks to himself that if Toki wasn't sick, then he would have chosen him to become the successor without a doubt. 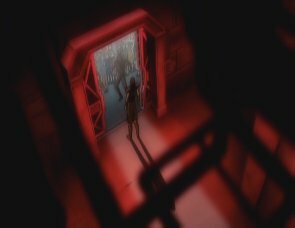 Soon the war does happen, and Toki protects Kenshiro and Yuria by letting them go inside the shelter whilst he remains outside, as there is no more room. Toki is still alive after this event, and meets up with Sara. The two go on a journey together and arrive in a village, where they start to heal as many people as possible. 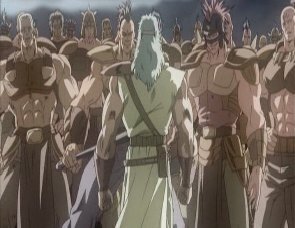 However, Raoh, who is now known as Ken-Oh (Fist King), believes that Toki is the only threat to his plans of conquest and has part of his army go out and capture him. Toki leaves with them peacefully, as he did not want the army to start slaughtering villagers. 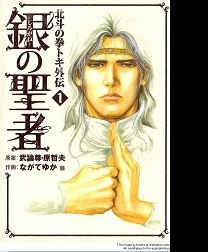 Toki is imprisoned in a place known as Cassandra, but is freed when Kenshiro arrives. 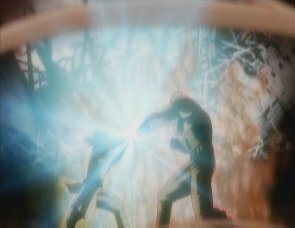 Toki defeats two guards via the Hokuto Ujou Hagan Ken (North Star Humane Face Breaking Fist) and leaves the prison with Kenshiro, before heading back to his own village and meeting up with Sara. But Toki says that the reason he came back here was to say goodbye. 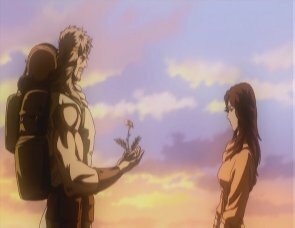 Toki tells her that he has a promise he must fulfill that he made with Raoh and now is the time. 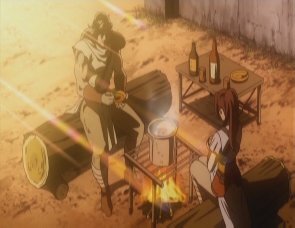 Sara realises that Toki must intend to fight Raoh and doesn't think he's serious, but he asks her for some help. Later on that night Toki says that she has a good knowledge of the pressure points, so she must know what he is about to do. He is about to press the pressure point "Sekkatsukou" on his own body. 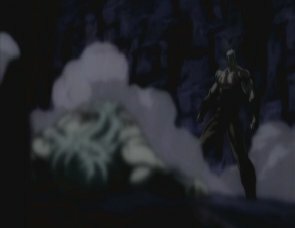 It is the only way he can defeat Raoh, but pressing this point will shorten his life and there is even a possibility of him dying from hitting it. Even so, he tells Sara to tie him to one of the pillars, as he might not be able to bear the pain and could go on a crazed rampage. Toki hits the point and survives. Back in the present, the fight between Toki and Raoh continues, and the two are on equal ground in terms of power. 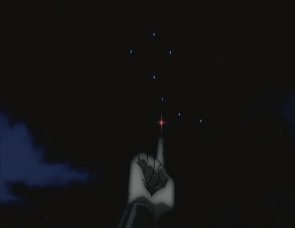 Toki points out that both he and Raoh can see the small star of death next to the big dipper, as Kenshiro explains to Lin and Bat that it is said that when two masters of Hokuto fight, both of them will be able to see that star, as even the heavens don't know who is going to win. 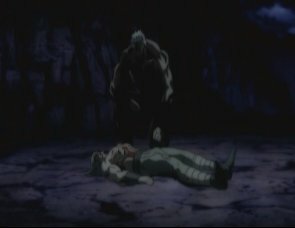 Toki manages to fatally strike Raoh, only to find that his move has not killed him -simply because his illness has prevented him from being as strong as he could be, and he no longer has the power to take Raoh down. 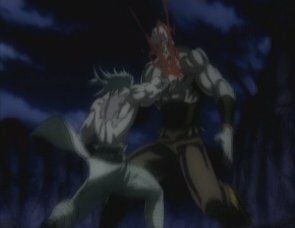 Raoh finishes the fight, but does not kill Toki. He instead punches the ground next to his brother's head. Raoh tells him to think of that punch as his big brother's spite towards his sad destiny -the fact that a great man like him will die from his illness. 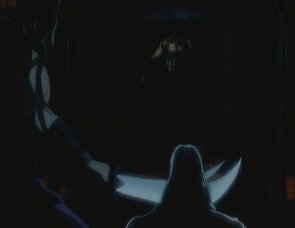 Kokuoh-Go comes over to him, and as Raoh gets on him and puts on his cape, he tells Kenshiro that Ken-Oh's legend begins now. If he wishes to end his life, he can try it whenever he wants. He then rides away on his horse. 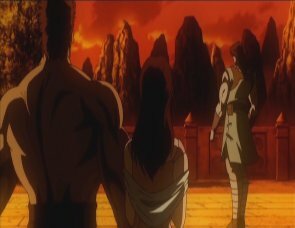 Kenshiro, Bat and Lin see to Toki. 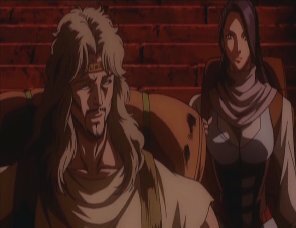 Toki says that he couldn't fulfil the promise he made with Raoh, and finally explains what exactly that promise was. Years a go, Raoh asked Toki why he trains as hard as he does. Toki tells him that it is still his ultimate goal to surpass his brother. Raoh laughs, but then tells him that if he should ever take the wrong path, he wants Toki to stop him. Toki told him that he understands his request. 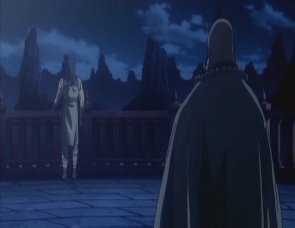 Back in the present once more, the sun starts to rise as Kenshiro tells Toki that he will fulfil that promise in Toki's place -that's the destiny of the successor to Hokuto Shinken. 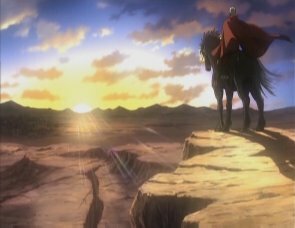 Meanwhile Raoh takes one last look at the battleground where he just fought his brother, as the sun continues to rise. He then has his horse turn around and he rides away. Ready to live the rest of his life in peace, Toki returns to his village, and reunites with Sara. -A manga called Toki Gaiden started publication early on in 2007, but has a completely different story than this anime. Created by Yuka Nagate, Toki Gaiden shows how Toki arrives at the Village of Miracles, how Amiba appeared and also shows completely new stories, such as featuring Juuza of the Clouds and the Zeed gang.